Whether you’re looking for serious sandcastle action on the beach with the family, a fun trip to a neighbouring island or an alfresco family-friendly dinner listening to the waves, Singapore has lots of great beaches and coastal parks dotted all around the island and beyond. From local hotspot East Coast Park to the buzzy beaches of Sentosa, here’s our pick of the best beach spots in Singapore for the whole gang. 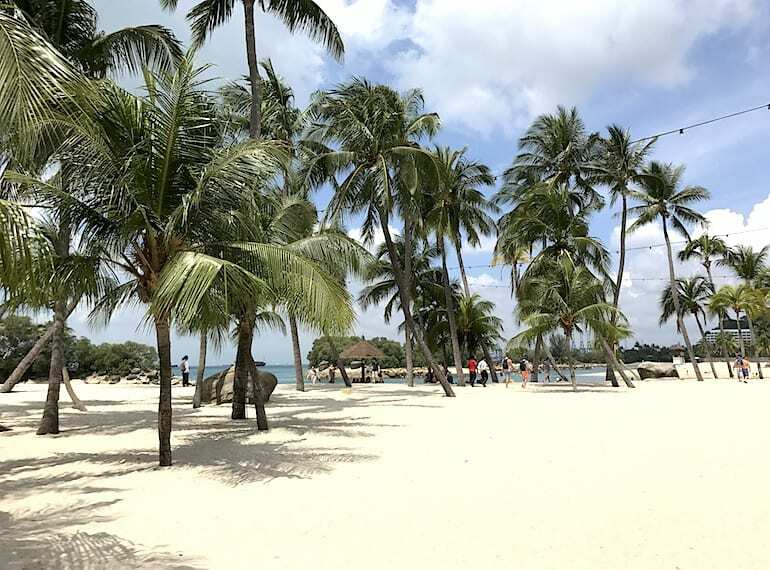 If you spontaneously find yourself with a free afternoon and the chance for relaxation, then head on over to Tanjong Beach and stretch out under the sun with a good book and your favourite playlist. 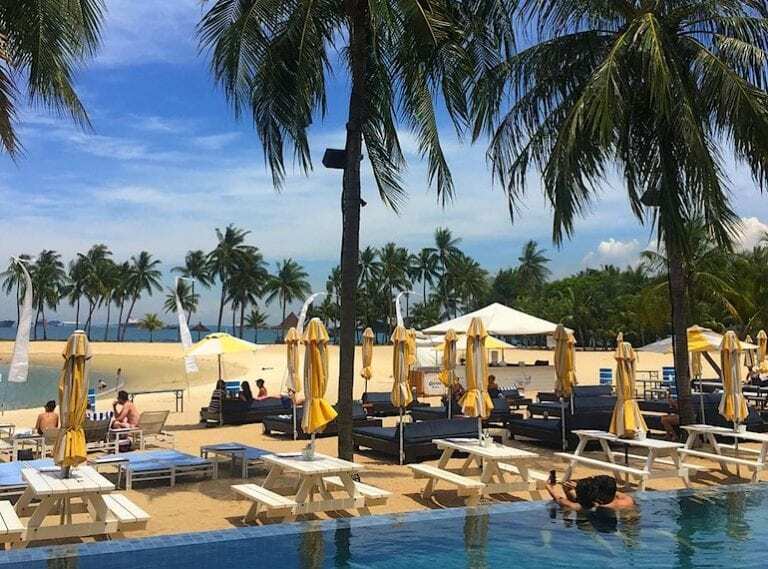 Easily accessible and yet not swarming with crowds, this is the perfect space to chill out – or if you’re in the mood for a cocktail, head on over to the famous Tanjong Beach Club to enjoy a bit of beach party vibe. Best time to go: Weekday afternoons. How to get there: Just a little further up from Palawan Beach, follow the footpath along the road until you see signs for Tanjong beach. Facilities: Tanjong Beach Club bar and restaurant, footpath, toilets, change rooms including showers, shelters, deck chairs for rental, shops at the Sentosa Express interchange. If escape is what you’re after, visit Singapore’s best-kept secret, Lazarus Island. As one of the southern islands, it is easily accessible via a short causeway from St. John’s Island, yet it possesses the rustic, tropical atmosphere of a deserted island. Expect to enjoy white sands and clear, turquoise waters that rival any island holiday destination in Asia. Best you visit soon before it becomes, well, not so much of a secret. Best time to go: Sundays and public holidays as the ferry operates till later (first departure from Marina South Pier: 9am). Or, if you’re looking for a more private experience, plan your visit for during the week (ferry starts at 10am). How to get there: You can purchase a ferry ticket at the Singapore Island Cruises counter at Marina South Pier, which will cost $18 for adults return, and $12 per child (age one to 12 years). The journey to St. John’s, where you disembark for Lazarus, will take about 30 minutes. From there you can cross the causeway on foot to Lazarus. Facilities: Beach pavilions, footpath, toilets on St. John’s island. There are however, no shops on either St. John’s or Lazarus, so be sure to stock up on refreshments before you leave. Camping: Not allowed. There are holiday bungalows at St. John’s should you wish to stay overnight. Kusu Island. Photography: Choo Yut Shing. Discover a little local folklore at Kusu (tortoise) Island, where legend has it a turtle turned itself into an island in order to rescue two sailors, one Chinese and one Malay. The Chinese consider the turtle a sacred animal, and today the island has a sanctuary that is home to hundreds. 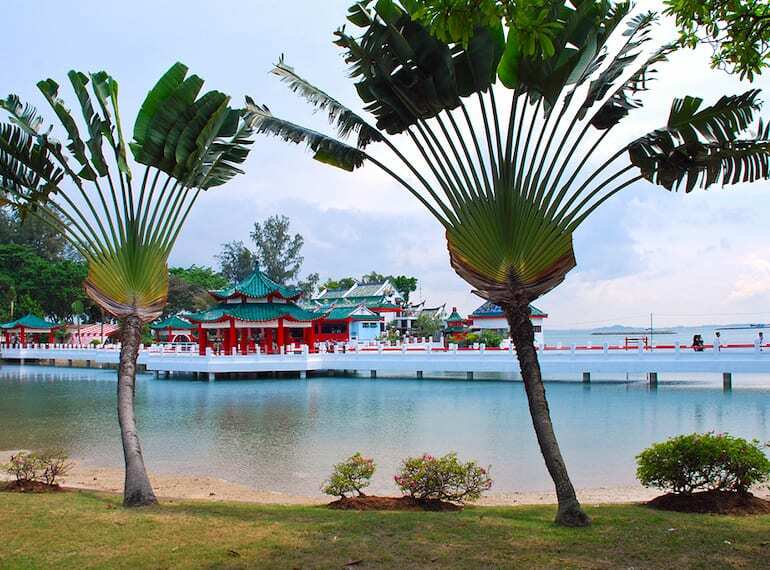 Make sure to visit the famous Da Bo Gong Chinese temple and three Malay shrines, all of which you can explore against a scenic backdrop of sand, sea and lush tropical greenery. Time your visit between September and November, and you’ll catch thousands of devotees visiting the island’s sacred sites during the annual Kusu Pilgrimage. Best time to go: Sundays and public holidays as ferry operates till later (first departure from Marina South Pier via St John’s Island: 9am ). 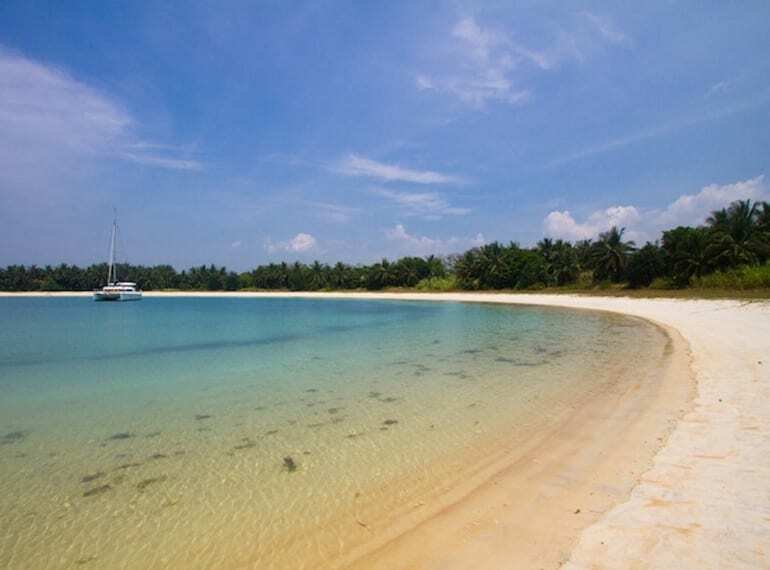 How to get there: Kusu Island is 15 minutes away from St. John’s Island by ferry, so if you have time to do both, we recommend you stop by Kusu to wrap up a few hours of swimming and suntanning at Lazarus. Facilities: Beach shelters, toilets, turtle sanctuary. As with Lazarus, there are no shops so you will need to bring provisions with you. 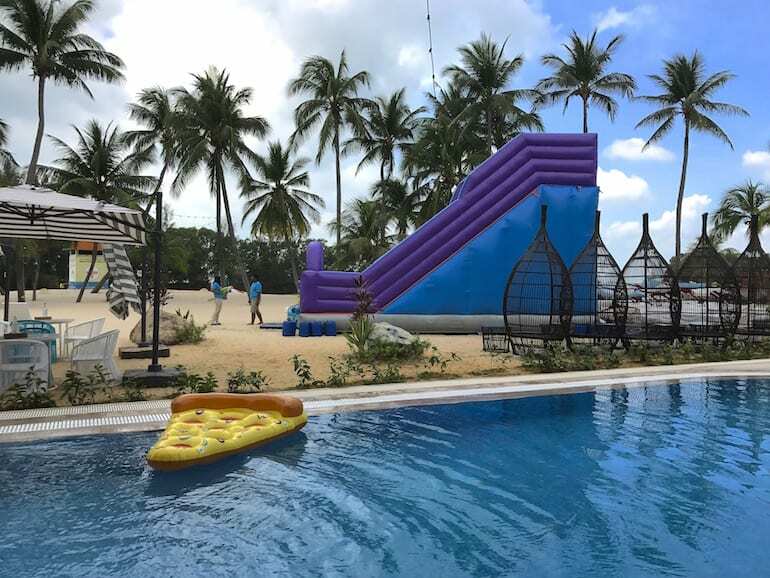 At this famously family friendly beach, kids will go nuts over the Palawan Pirate Ship where they can enjoy swimming and splashing in the water play area, complete with pirate ship! You can also check out the Southernmost Point of Asia, a pretty islet which you reach by crossing the rope swing bridge and climbing the wooden beam towers to enjoy stunning sunset views. How to get there: You can either drive or take the MRT to HarbourFront, where you can purchase a ticket on the top floor of VivoCity shopping mall for the Sentosa Express (or use your EZ-link card). Alternatively, you can walk along the beautifully landscaped Sentosa Boardwalk for free. Facilities: Restaurants, canteen, shops, toilets, beach shelters and picnic areas, children water fountain play area, Port of Lost Wonder water play park. 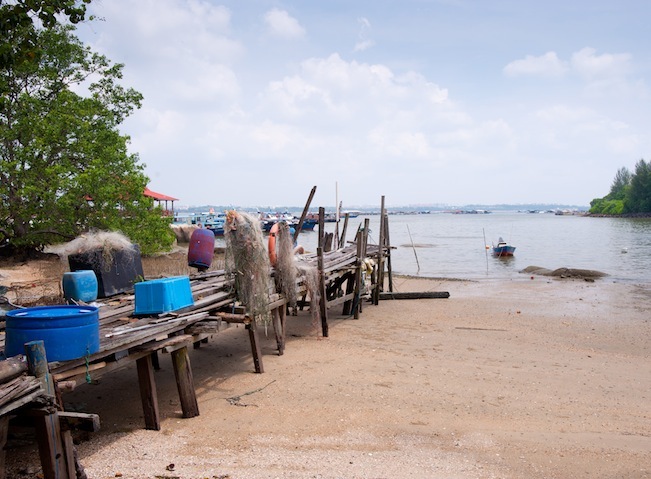 Take a walk along the 2.2km Changi Boardwalk and enjoy peaceful sea views and the kampung atmosphere along the outskirts of Changi Village as you head to the cool shade of Changi Beach Park. This is one of the oldest coastal parks in Singapore, and is a long-time favourite amongst locals for family picnics. 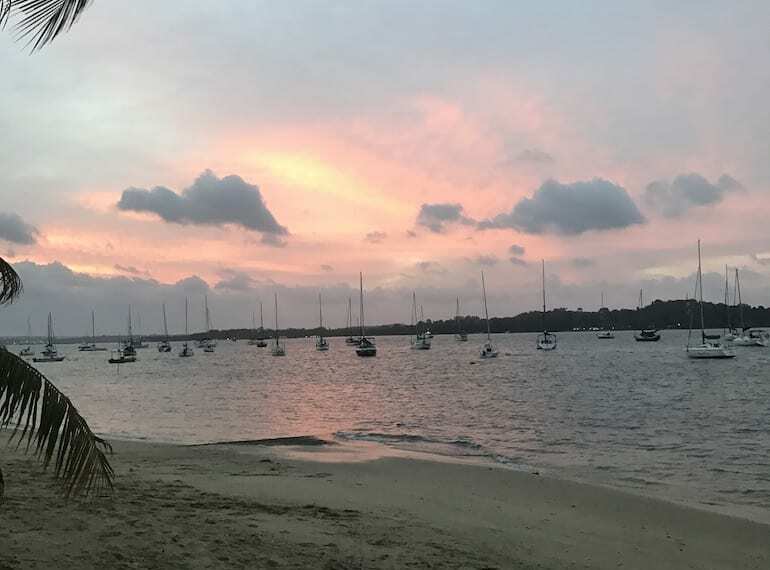 Keep walking towards Changi Sailing club for a perfect sunset Instagram shot! How to get there: Nearest MRT station is Tampines, from there you can catch bus no. 29 to outside Changi Village Hotel for the Boardwalk, or at the bus terminal near Changi Beach Park. Alternatively, there are car parks located along Nicoll Drive if you are traveling by car. Facilities: Children’s playground, barbecue pits, park benches, shelters, paved walking trail and cycling path. If you enjoy beaches with a bit of buzz, then Siloso Beach is the place to be! We love the kid-friendly vibe and delicious brunch offerings at Ola Beach Club, but more adventurous kiddos might want to try out a circus trick or two on the flying trapeze at Trapizza. Coastes always gets a big family thumbs up for its great menu (there’s something for even the fussiest of eaters) and chilled setting on the sand (its cocktails are pretty spot on too!). Best time to go: Sundays. How to get there: At the Sentosa Express Terminal, you turn right following signs to Siloso beach, which you can either access via the footpath or by taking the Beach Tram. Facilities: Restaurants, shops, toilets, beach shelters, pavilions, footpath, deck chairs for rental. Get a glimpse into rustic village life at Pulau Ubin. 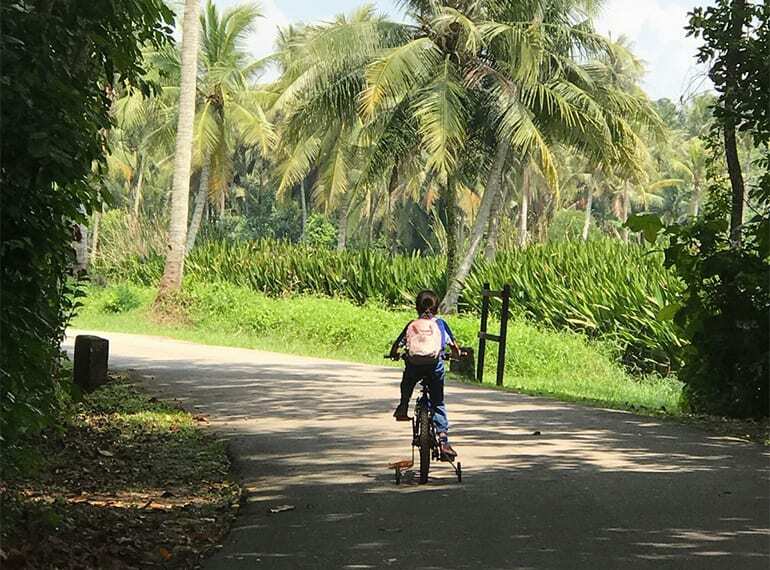 Pulau Ubin is one of our favourite family days out and gives the kids the chance to glimpse how Singapore was during the kampong days. Rent a bike and go on an exploration adventure through plantations and mangrove forests before checking out the famous Chek Jawa wetlands. Stop at one of the secluded beaches for a picnic: but look out for the monkeys trying to steal your lunch! Best time to go: Saturdays or Sundays. How to get there: Take a bumboat from Changi Point Ferry Terminal, which will cost $2.50. However, it will only leave once there are 12 passengers, so you may have to wait. Alternatively, you can pay $30 to leave directly. The bumboats operate from sunrise to sunset, but special arrangements can be made for after dark excursions. Facilities: Cycle path, footpaths, mountain bike rental, stores and eateries, Jawa Visitor’s Centre with viewing jetty. Camping: Allowed in designated areas.